We’re off to tour Edinburgh Castle. From the craggy heights of Castle Rock, this mighty fortress dominates Edinburgh’s skyline. It is believed that a stronghold existed atop this volcanic rock since 600 AD; there has been a royal castle on the site since at least 1100. 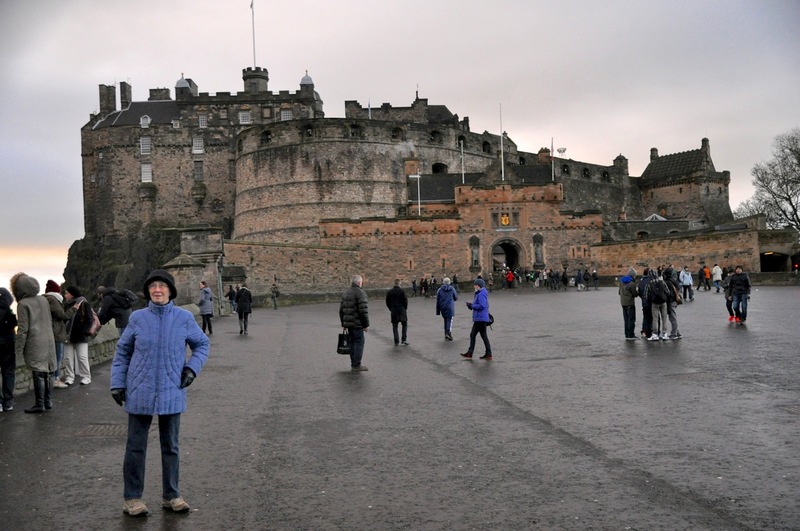 As one of the more important strongholds in Scotland, Edinburgh Castle was involved in numerous historical conflicts, suffering through 26 known sieges in its long history. It claims to be the most besieged place in Great Britain (and one of the most attacked in the world). I’ll illustrate by covering just 45 years. In 1296 English King Edward I invaded Scotland during the First War of Scottish Independence, capturing the castle when it surrendered after 3 days of bombardment. Nearly two decades later in 1314 it was recaptured in a surprise night attack by the Scots, who scaled the near-vertical north cliff face; the castle’s defenses were destroyed to prevent re-occupation by the English. Twenty years later in 1333 the English King Edward III occupied and refortified the castle during the Second War of Scottish Independence. In 1341 the Scots, disguised as merchants bringing in supplies, retook the castle and killed the garrison of 100. And so it went. The castle was both royal residence and fortress, but beginning in the 1400’s it was increasingly used as an arsenal and armaments factory. 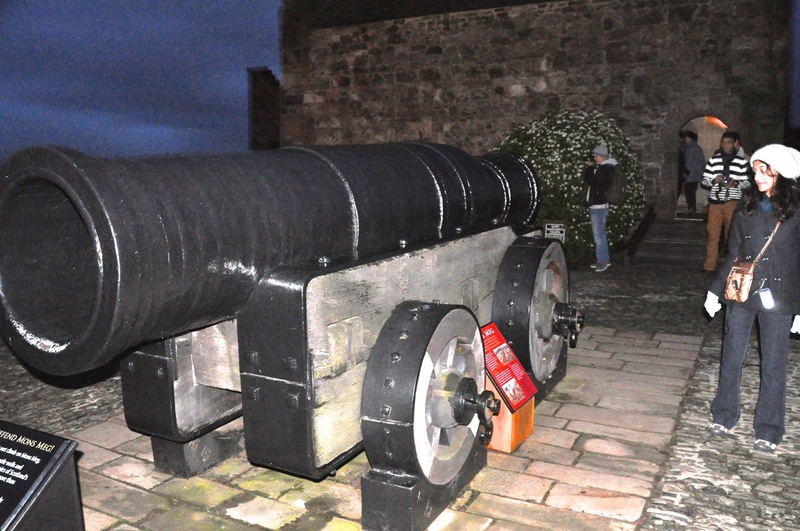 The monster cannon Mons Meg was delivered to Edinburgh in 1457, and by 1541 the castle had a stock of 413 guns. Increasingly the royal family stayed not at the Castle but at the Holyrood Abbey. In 1501 King James IV built the Holyroodhouse palace by the abbey at the end of the Royal Mile (see the previous post Edinburgh I) and made it his principal Edinburgh residence. Edinburgh Castle was then used by royalty only for safety or state functions. Pertinent to what the Castle looks like today was the Lang (long) Siege of 1571, precipitated by the reign of Catholic Queen Mary – a reign opposed by many of the Protestant Scottish nobility. A year after giving birth to King James VI at Edinburgh Castle, Mary was forced to abdicate and fled to England (well, not only was she a Catholic, but soon after her husband’s murder she did marry the chief murder suspect …). Her infant son was now King, but Scottish loyalties were divided; some supported the Catholic Queen, others the Protestant Regency that ruled for the infant King James. The Keeper of the Castle, Sir William Kirkcaldy of Grange, switched sides to support Mary and occupied the Castle and the town for the Queen. The town was put under siege by forces loyal to the King over the course of a year (for a month here and there), with occasional skirmishes; the castle was blockaded, and the Palace of Holyroodhouse was garrisoned by the King’s men. Grange destroyed homes outside the castle to create a “killing ground”. The King’s supporters, lacking resources and fearing that Grange would get help from the French, petitioned English Queen Elizabeth I for aid (Queen Elizabeth I ultimately had Mary Queen of Scots executed). A truce was negotiated that lifted the blockade, gave Edinburgh to King James and confined Grange to the castle. However, when the truce expired the following year, Grange began bombarding the town. The King’s men responded by laying siege to the castle. Grange’s supplies of powder and shot were running low, there were only seven gunners available to man the 40 cannon, and the castle’s well had been poisoned. All other supporters of Queen Mary had surrendered, yet Grange continued to resist and the garrison continued to bombard the town, killing a number of citizens. Sorties were made from the castle to set fires, 100 houses were burned, and anyone attempting to put out the flames was fired on. Finally 1,000 English troops arrived with 27 cannon and, over a 12 day period, 3000 rounds hit the Castle. Walls and towers collapsed. Grange finally sued for peace, but when informed he would not be freed, he resolved to continue resistance; the garrison had other ideas, and threatened mutiny unless he surrendered. He and several others were subsequently hanged (at the Mercat Cross described in the Edinburgh I post). The Castle suffered considerable damage; only a few buildings remain from the period before the Lang Siege, the most notable being St. Margaret’s Chapel from the early 1100’s (the oldest building in Edinburgh), the Royal Palace, and the Great Hall from the early 1500’s. From the 1600’s on the Castle was principally used as military barracks with a large garrison. walled, and exposed corridor to another gate, in this case the Portcullis Gate built in 1574 as the main entrance to the castle after the Lang Siege (that different-colored top story added later). And then of course there’s another gate, Foog’s Gate from the 1600’s. 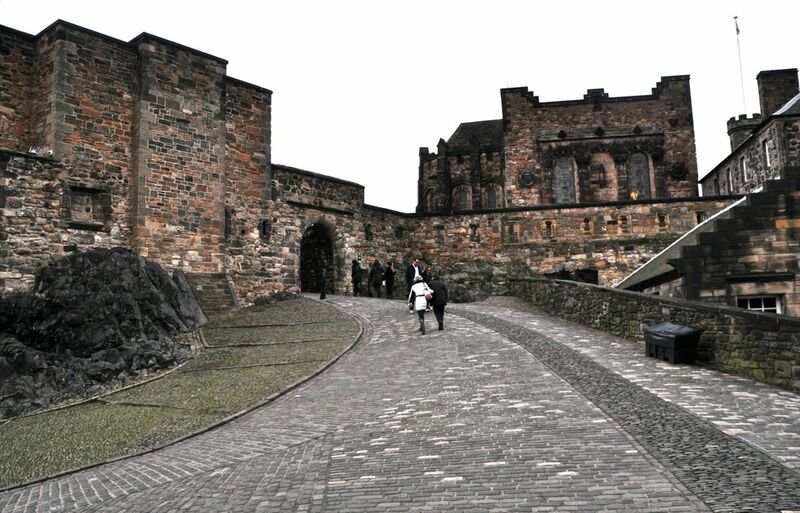 It leads to the highest point and heart of the old castle, Crown Square, laid out in the 1400’s (James III) and formed by Scotland’s National War Memorial, the Royal Palace, Great Hall, and Queen Anne Building (previously the site of kitchens for the Great Hall, now a 1700’s building, extensively remodeled). They’re shown below. required. That last room is Laich Hall, created in its present form in 1617 to serve as an outer reception room and dining chamber for James VI. Also at the Royal Palace were Scotland’s crown jewels consisting of crown, scepter and sword. Joining a long line, we weaved past replicas (poorly made) where we could take pictures, and then (keep walking) zipped past the originals, no pictures allowed. I should note that Scotland’s crown, scepter and sword of antiquity were taken by England and melted down when Edward I captured Scotland in 1296 (noted above); the current crown jewels are from two centuries later, and only survive because they were hidden from Oliver Cromwell when he defeated Scotland in 1652. King James IV by the pope in 1494; it was refashioned for James V in 1536. The sword is also a papal gift, presented to James IV in 1507; the handle is silver gilt. The origin of the crown is uncertain; it was refashioned for James V in 1540. It’s made of Scottish gold, engraved and enameled, and ornamented with diamonds, garnets, amethysts, quartz and pearls. The bonnet is velvet and ermine. hammerbeam roof, one of only two in a medieval hall in Scotland. classic Norman style such as the zigzags decorating the arch between nave and sacristy. The chapel was used as a gunpowder store from the 1500’s – it is well positioned near the cannon batteries. The small windows feature St. Margaret and St. Columba who brought Christianity to Scotland from Iona. would have in 1781. Objects made by prisoners at that time were also on display. 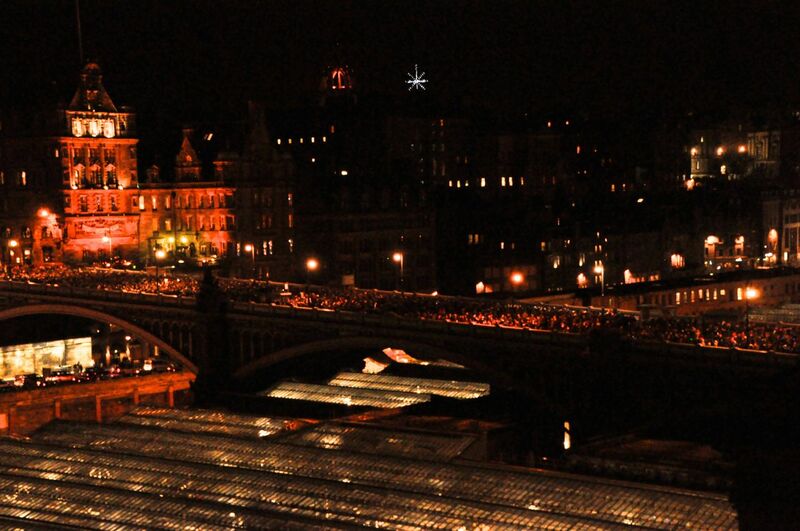 Finally, a look over Edinburgh from the castle heights, and a look back at the castle. 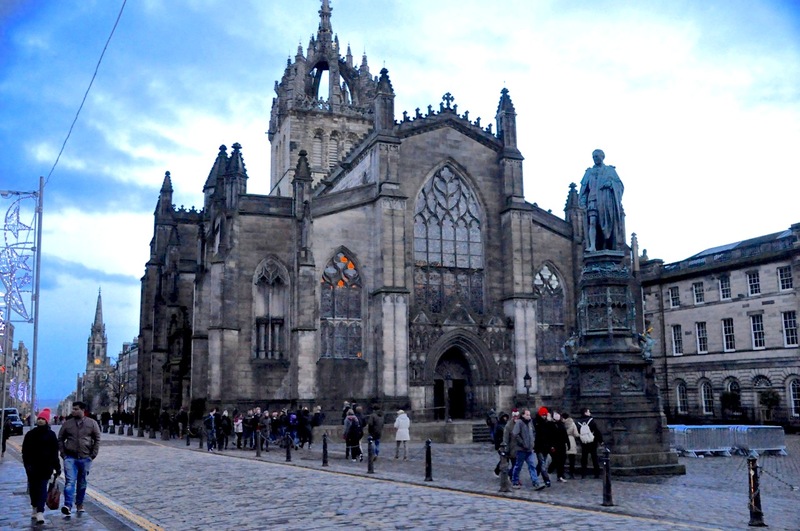 St. Giles’ Cathedral is Scotland’s most important church, functioning similar to that of England’s Westminster Abbey. Its oldest part dates from 1124; much of the current interior was built in the very late 1300’s after the English set it on fire in 1385. Subsequently many chapels were added, enlarging the church but giving it an irregular plan. The Scottish crown steeple, a proud part of Edinburgh’s skyline, was added in 1495.
church was simplified, with an emphasis on sermons rather than rituals. He replaced the medieval stained glass with clear glass windows (darn it!) – to allow people outside the packed church to participate in the service. The last picture above, a new window from the 1800’s, shows Knox preaching to a standing-room-only congregation. In subsequent centuries St Giles Cathedral was subdivided into as many as 4 separate churches, and by the 1800’s it was in poor condition. Extensive renovation in the 1800’s, including installing its beautiful stained glass windows, gave us the church we see today. Pictures of the impressive interior are shown below. In the center of the nave are 4 massive pillars from 1124, shown below. don’t do windows. Above are three examples, along with a panel detail from the 2nd and 3rd windows. The gorgeous window below is from the end of the nave. Really, almost all of them are pretty spectacular, another example shown below. There are just an amazing number of beautiful windows here. I’m going to simply dump a bunch of pictures into one large grouping showing windows with their panel details. I hope you’ll agree they’re fabulous. Finally, the Thistle Chapel within St. Giles is relatively new (1911), built for Scotland’s “Most Ancient and Most Noble Order of the Thistle” (the order founded by King James VII in 1687). The chapel is exquisite, as shown below. behind in writing these blogs! Hey, quit your bitchin’. I’m still doing it, right?). And then the fireworks start. They are spectacular, and we’re between the two sites; the castle in the distance, and Calton hill nearby on our other side. Below are some shots, both directions. So we’re off by a year, but it’s almost timely! Happy 2016, everybody! Next post – back to the Highlands!